All of us must have come across her name-Irom Sharmila, in newspapers, magazines and electronic media. Only a few of us actually know: Who is she? why is she doing protest in such a manner? What are the circumstances that forced her to take such a harsh step? Well, Imagine a situation where you see bloodshed, murder, violence on a daily basis. People in uniform (Indian Army) would visit your locality and kill innocent people. What impact would it have on your mind? How would we react to it? Most of us would react to this situation by remaining silent .Some would even stay indoors. None of us would dare to stand against the mighty Indian Army. 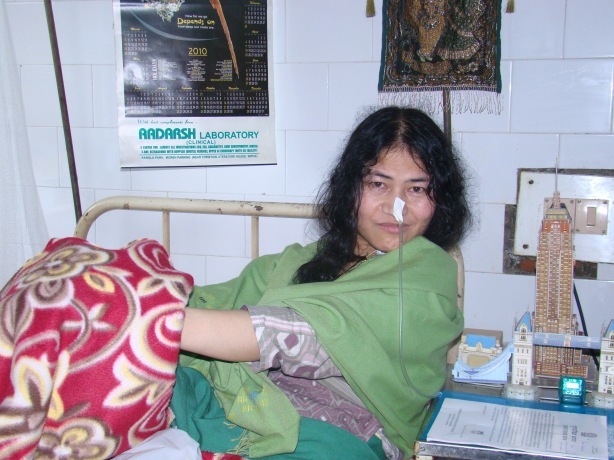 Under such horrible circumstances, Irom Sharmila Chanu, the 28-year-old daughter of a Grade IV veterinary worker , decided to fight against the powerful army and its draconian law – the armed force special power act. Even though she belongs to a poor and humble background, her continued fight against AFSPA speaks volumes of her courage and integrity. It all started on 2 November 2000, in Malom, a town in the Imphal Valley where ten civilians were allegedly shot and killed by the Assam rifles, one of the India’s paramilitary forces, operating in the state, while waiting at a bus stop. The incident later came to be known to activists as the “Malom Massacre”. The next day’s local newspapers published graphic pictures of the dead bodies, including one of a 62-year old woman, Leisangbam Ibetomi, and 18-year old Sinam Chandramani, a 1988 National Child Bravery Award winner. It was this incident that made the then 28 year aged Irom Sharmila Chanu start her indefinite fast as a mark of protest against the atrocities done by army. Since then, she has been regularly arrested by police on charges of “attempt to suicide”.By 2004, she had become “an icon of public resistance” .In October 2,2006 , she visited Rajghat and paid floral tributes to Mahatma Gandhi. At the same time, she met and won the support of Nobel-laureate Shirin Ebidi , the Nobel Laureate and human rights activist, who promised to take up Sharmila’s cause at United Nations Human Rights Council. In 2011, she invited anti-corruption activist Anna Hazare to visit Manipur, and Hazare sent two representatives to meet with her. In October 2011, she received support from Manipur Pradesh All India Trinmool congress and they urged the party chief Mamata Banerjee to support the cause of Irom . Apart from being a political activist, she is also a poet. Her poem “”Fragrance of Peace” is quite popular among the youths of Manipur. She has also received awards in India and abroad. She was awarded the 2007 Gwangju Prize for Human Rights, which is given to “an outstanding person or group, active in the promotion and advocacy of Peace, Democracy and Human Rights“. In 2010, she won a lifetime achievement award from the Asian Human Rights Commission. In spite of all this, the government of India has not repealed the AFSPA and had not taken any action against army jawans and officers indulging in atrocities. So a question arises: Is this acceptable? Being a citizen of India, is it not our duty to express solidarity with her? Manipur is as integral a part of India as the rest of the states are. For how long, will we tolerate the injustices done to innocent Manipuris by the devils in the army? Is it not high time to repeal AFSPA at least for a temporary period of time? Much more, the episode of Irom Sharmila also brings about serious questions about our democracy and how it operates at ground level. It is no doubt to say that it is a blot on the face of India. Well, these are the questions whose solutions are to be found out by the Government of India and the people. Merely writing articles or giving condolences won’t work, much more needs to be done. We need to be united. We need to tell the Government that we all want it to be repealed. We all want her voice to be heard.